Last week when Baseball America released it’s prospect list, second baseman Devon Travis was ranked number one for the Detroit Tigers. Later that day, he was traded to the Toronto Blue Jays for center fielder Anthony Gose. 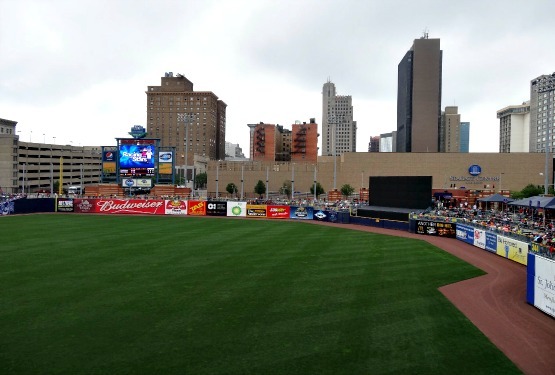 The Tigers were actually trying to convert Travis to the outfield, as he played there late this season before suffering a core muscle injury in the final week of the season for the Double-A Erie SeaWolves. The injury kept him out of the Arizona Fall League, where he was scheduled to play second, but still see work in the outfield. Travis hit .298 with 10 home runs, 52 RBI’s, 156 stolen bases for Erie this season. 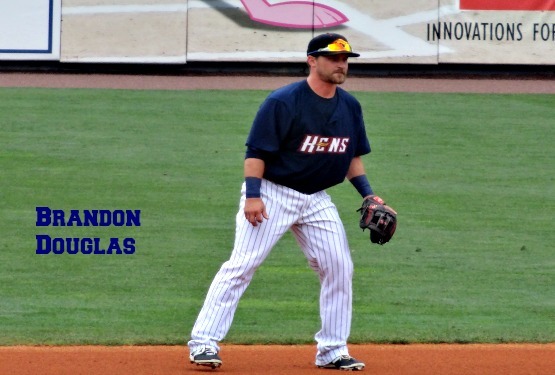 He played 77 games for the Whitecaps in 2013, hitting .352 with 102 hits before being promoted to the Lakeland Flying Tigers. He was a 13th-round draft pick by Detroit in 2012. Despite the surprising trade, Travis had nothing but positive things to say about the Tigers organization. In exchange, the Tigers get left-handed hitter Anthony Gose, who is expected to possibly platoon in center with Rajai Davis, who bats right. I’m not sure why Detroit would trade their number one prospect for a platoon player, but the team has been without a true center fielder since trading away Austin Jackson. Gose is sure to help defensively, though. It’s frustrating sometimes seeing some pretty good prospects play in the minor just to be traded away, but that’s the business of baseball. We do wish Travis the best in Toronto’s organization. 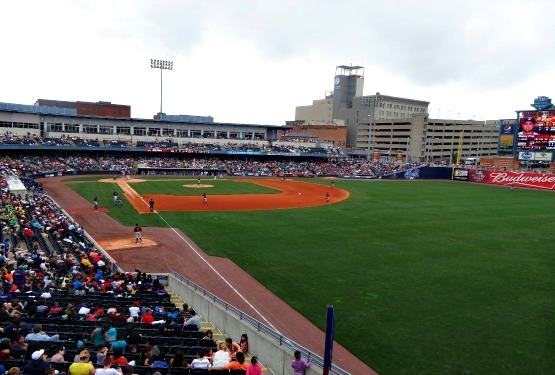 Detroit’s top 10 list by Baseball America includes seven former Whitecaps including Steven Moya, Buck Farmer, Domingo Leyba, Kevin Ziomek, Hernan Perez, and James McCann. 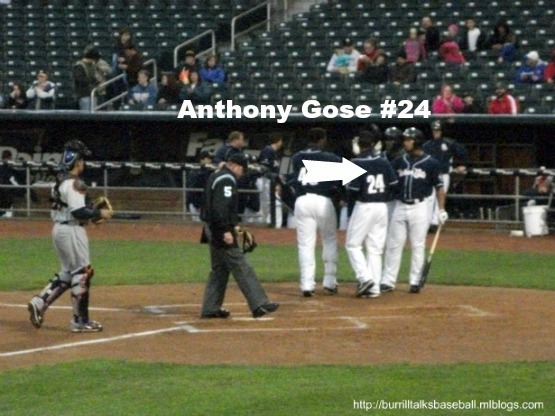 As for Gose, we actually saw him play a couple of games for the New Hampshire Fisher Cats back in 2011, one in Manchester and one on the road in New Britain. 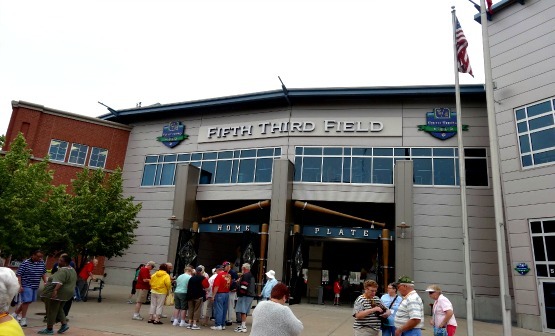 This time of year, Minor League Baseball honors the players in each organization’s farm who had the best seasons. This season was a good one for the Detroit Tigers‘ minor leaguers, as many of them had some solid stats. I’ve always enjoyed following the players up through the system, especially the ones who played in West Michigan for the Whitecaps. 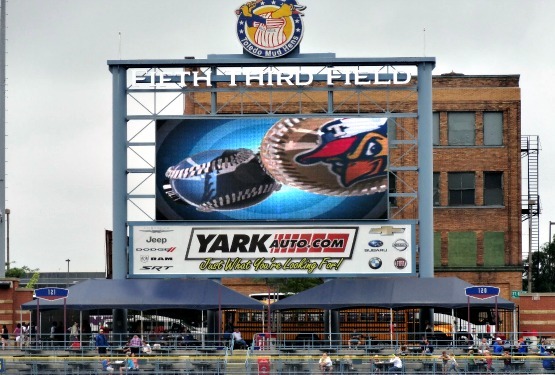 I plan on making trips down to Toledo and Erie, along with my usual stops in Grand Rapids, so I’ll have a good chance to see most of these players next season. It looks like eight out of the 12 selected played for the Whitecaps at one point in their career. Catcher-James McCann (Erie Seawolves): Suited up for nine games with West Michigan in 2009. This season with Erie, he hit .277, with 30 doubles, eight home runs, and 54 RBI’s. His BA, doubles, along with 178 total bases and 50 runs scored, lead all catchers in the system. Behind the plate he threw out 28 of 76 base runners (1/3), and had a .991 fielding percentage. Lennerton with the ‘Caps in 2009. 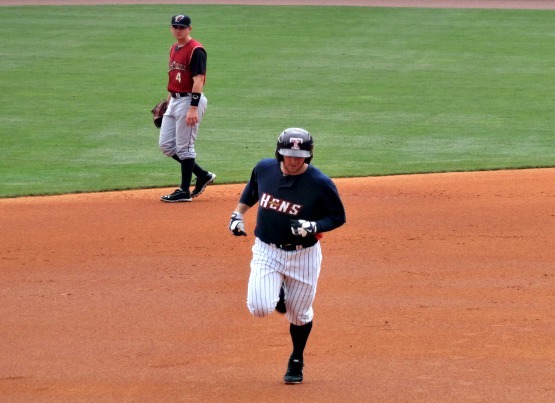 First Base-Jordan Lennerton (Toledo Mud Hens): Played for the Whitecaps during the 2009-10 seasons. 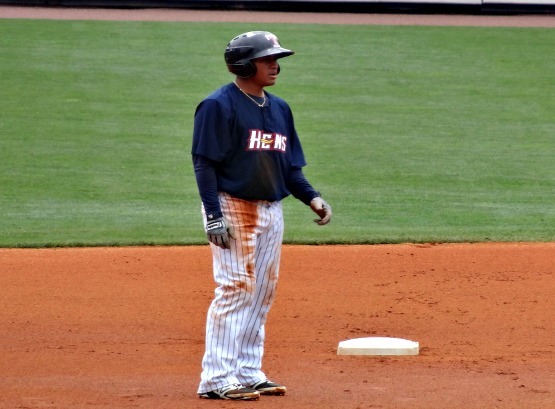 This season with Toledo, he lead all first basemen with 17 home runs and 143 hits. 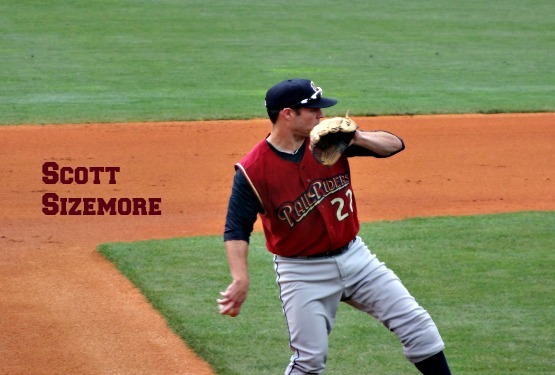 He placed second in the Tigers organization with 84 walks, fourth with 57 RBI’s, and fourth with 221 total bases. Devon Travis had one of the best minor league seasons I can remember. 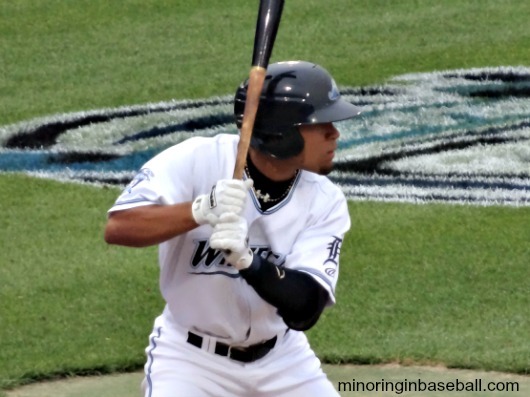 Second Base-Devon Travis (West Michigan Whitecaps/Lakeland Flying Tigers): Played most of the season in West Michigan before being promoted to Lakeland. Travis was the Midwest League All-Star Game MVP, the Tigers’ Minor League Player of the Year, and won two MiLBY Awards for Breakout Prospect and Offensive Player. He hit .351 across both leagues, and lead all middle infielders with 16 home runs and 76 RBI’s. He was also successful in 22 out of 26 base stealing attempts. 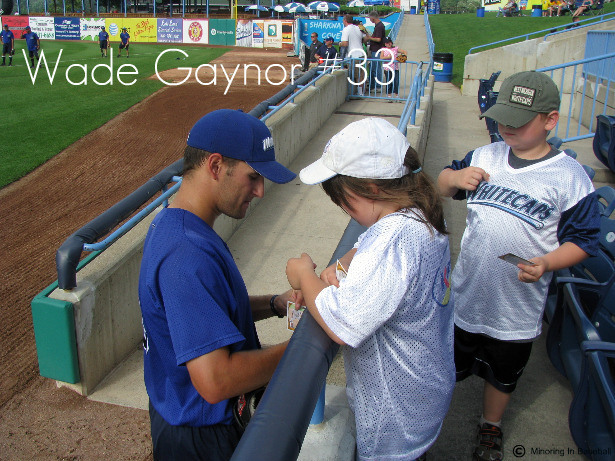 Third Base-Wade Gaynor (Erie Seawolves): Played for the ‘Caps during the 2010 season. This season with Erie, he lead all players at the hot corner with 108 hits, 179 total bases, 64 RBI’s, 31 doubles, and 12 stolen bases. He also contributed 12 homers and 45 extra-base hits. Shortstop-Eugenio Suarez (Erie Seawolves/Lakeland Flying Tigers): Won a Gold Glove last season with the Whitecaps, as the best defensive shortstop in the minors, and a Midwest League All-Star. 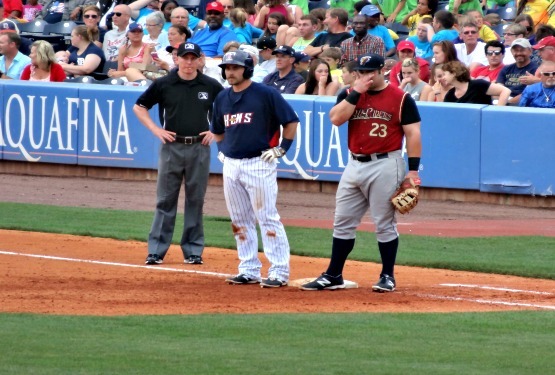 In 2013 with Lakeland and Erie, he hit .264, added 10 home runs (career high), 57 RBI’s across both levels. He led all Tiger shortstops with six triples and 70 runs scored. 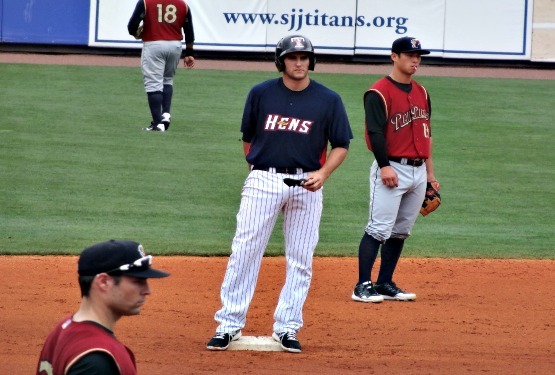 Outfield-Danny Dorn (Toledo Mud Hens): Dorn led all Tigers’ minor leaguers with 25 home runs and 82 RBI’s. He ranked second in the system with 228 total bases, also. He was signed by Detroit as a free-agent in 2012. Outfield-Tyler Collins (Erie Seawolves): Skipped over the Whitecaps, moving up to Lakeland from Connecticut. He ranked second in the system with 21 home runs and 79 RBI’s, hitting .240, with 29 doubles, and 67 runs scored. 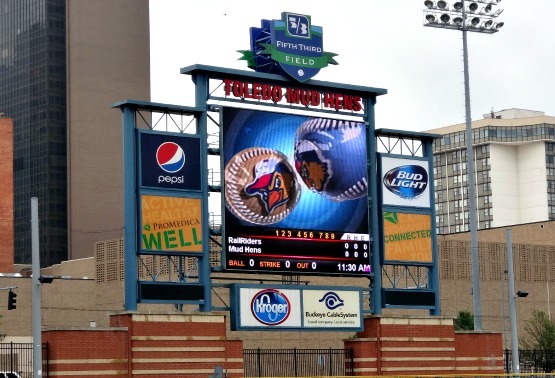 Outfield-Nick Castellanos (Toledo Mud Hens): Played with the Whitecaps in 2011. 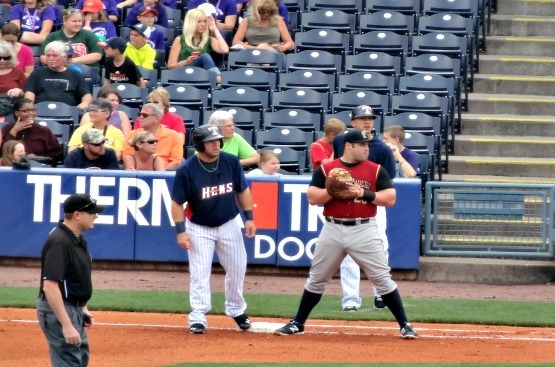 Was called up to the big team for 11 games this season, but with Toledo he hit 18 homers and 76 RBI’s. He also led all outfielders with 240 total bases and 81 runs scored. His biggest improvement, was cutting down on strikeouts, and drawing more walks this season (54). I’d like to see him starting for Detroit next season in left field. Utility Player-Daniel Fields (Erie Seawolves): The Michigan native hit .284 for Erie this season, hitting 43 extra-base hits including 10 home runs. He added 58 RBI’s, 24 stolen bases, and 71 runs scored. 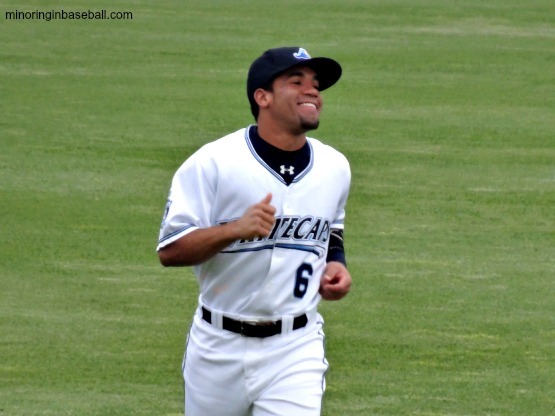 Starter/RHP-Wilsen Palacios (Lakeland Flying Tigers): Played for the Whitecaps last season. In 2013 with Lakeland, he posted a 3.07 ERA and struck out 109. He held opponents to a .238 batting average and 1.23 WHIP. Had a 7-8 record in 23 starts, including a complete game. He’s currently pitching in the Venezuelan Winter League. 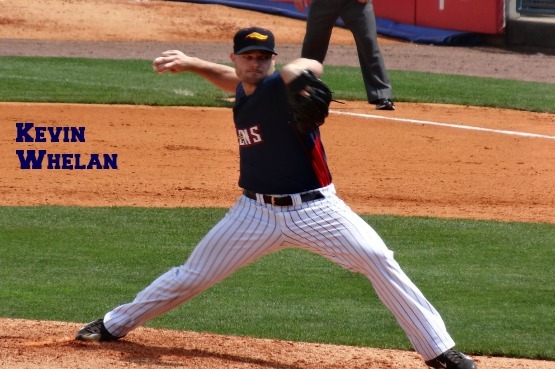 Starter/LHP-Kyle Lobstein (Erie Seawolves/Toledo Mud Hens): Playing 15 games with the ‘Wolves and 13 with the Hens, he went 13-7 this season. He led all pitchers in wins and with 148 strikeouts. across both leagues, he boasted a 3.27 ERA. 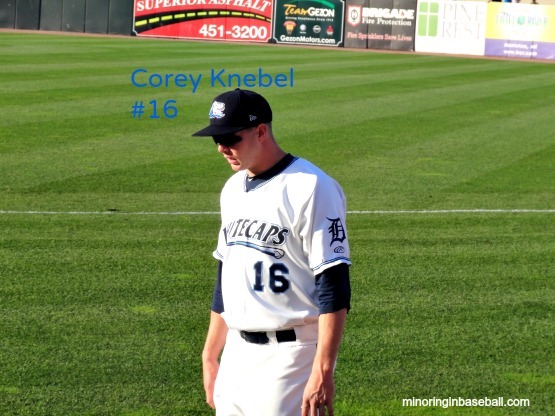 Relief Pitcher-Corey Knebel (West Michigan Whitecaps): Played for the Whitecaps this season, after finishing his collegiate career at the University of Texas. He had 15 saves in half a season for the ‘Caps, good for fourth in the system. Had an impressive 41-to-10 strikeout to walk ratio, and held opponents to a .133 average, and had an ERA of 0.87. Being a non-roster invitee to major league spring training, is like being in high school, and getting a birthday party invite from the prettiest girl in school. For six former members of the West Michigan Whitecaps, being invited to the Detroit Tigers camp must seem pretty sweet. The Tigers have 17 non-roster invites in all. Of all the invitees, utility man Don Kelly has the most experience at the big league level. He recently re-signed with the Tigers, after being told after the World Series that there would not be room for him on this years roster. Kelly played for the Whitecaps back in 2002, batting .286. He had 21 doubles and 59 RBI’s, plus an impressive .728 OBS. Kelly only hit .186 at the major league level last season, but due to his versatility and experience he may have a chance to crack the roster. 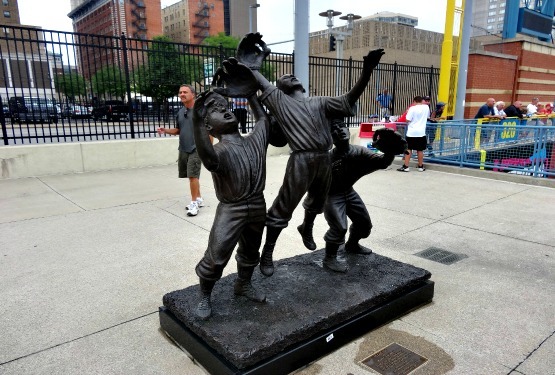 An obstacle in his way, though, is that the Tigers are looking for a right-handed hitter to platoon with Dirks in left field, and Kelly is a lefty. 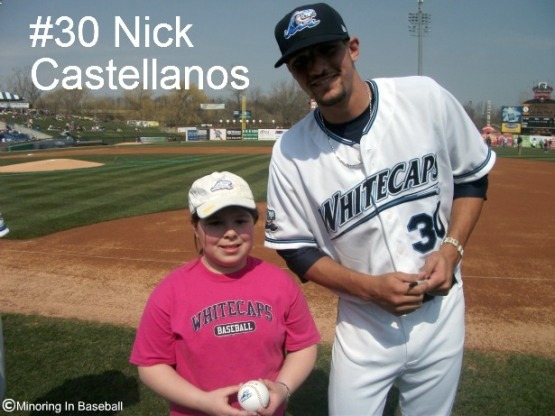 Top prospect Nick Castellanos (pictured above with Lily) will be at the Tigers camp, also. He did his time in West Michigan in 2011, when he was just 19 years old. After a slow start, he really had a solid season, hitting .312, with seven home runs and 76 RBI’s. 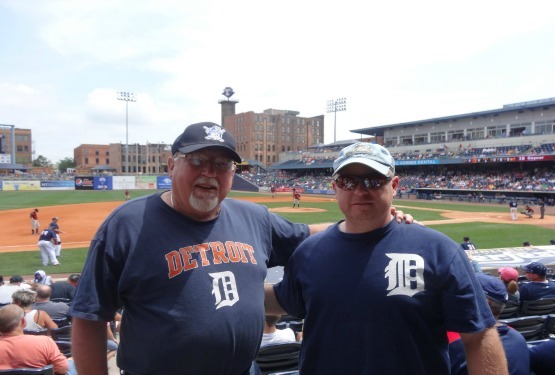 He patrolled third base at Fifth Third Ballpark, but was moved to the outfield last season, after Miguel Cabrera took over the hot corner in Detroit. Castellanos made 23 errors at third for the ‘Caps, and ended the year with a .917 fielding percentage. With his defense not being his strongest asset, the move could be good for him, but he just needs time to develop those skills, so I doubt that he’ll be making an appearance at Comerica this season. Be patient, though, his time will come. Castellanos was the Tigers Minor League Players of the Year in 2011, also. Two of the three catcher invited to camp played for the Whitecaps, too. James McCann was the Tigers’ second round pick in 2011 after finishing his collegiate career at the University of Arkansas. He played nine games for the Whitecaps in 2011 also, hitting only .059, with two singles and one double. He only made one error, though, and threw out 4 runners out of 19 attempting to steal. Curt Casali was also drafted by the Tigers in 2011, after playing his college ball at Vanderbilt University. 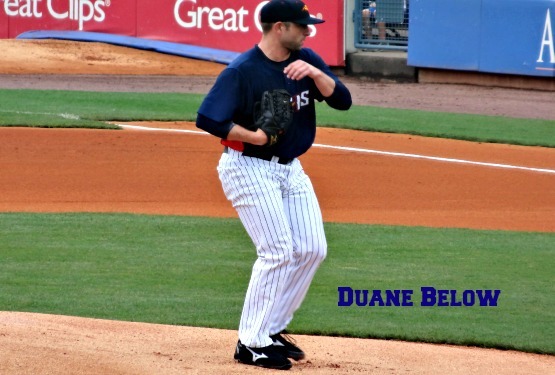 He played parts of two seasons in West Michigan, 2011 and 2012. In 2011, he played 25 games hitting .227, with two home runs and 14 RBI’s. He only made one error behind the plate, and threw out seven base runners. In 2012, his average increased to .288, with 12 doubles, eight home runs, and 25 RBI’s. He only allowed on passed ball, and threw out 20 potential base stealers. In my opinion, the Tigers are still a little weak at catcher, so if either of these guys has their bat catch fire, they have an outside chance of making the roster. 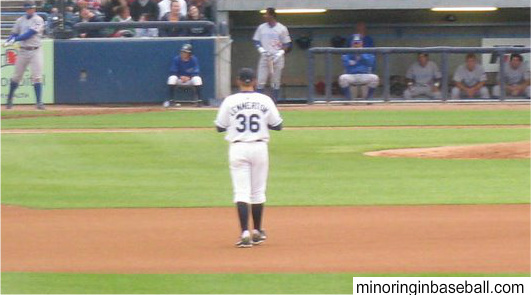 Kenny Faulk pitched for the Whitecaps back in 2010. His record was 5-4 with an impressive 2.16 ERA. He made 12 saves, giving up no home runs, and striking out 78. His ERA inflated last season at the Double-A level, so he’ll need to bring that down a bit before getting consideration. I’d have to gauge his fast ball, and see his secondary pitches before making an informed opinion on his chances to make the team, though. I look forward to seeing him in spring training, and hope he can earn a spot. Another weakness in Detroit is at the short stop position. 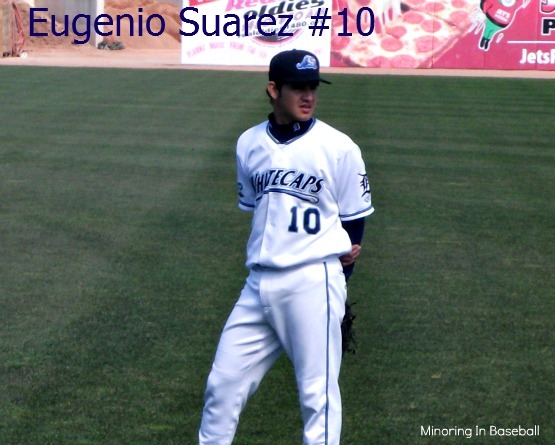 Last season, though, the Whitecaps’ Eugenio Suarez won the Golden Glove as the best short stop in the minor leagues. 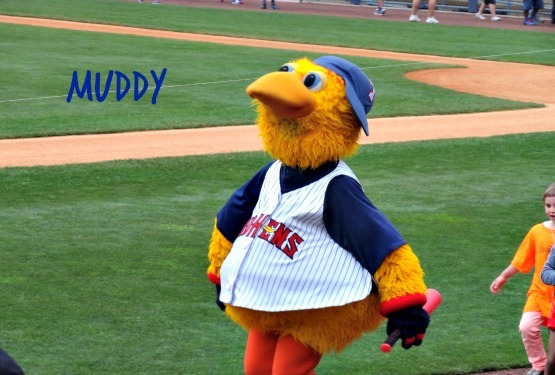 He played 119 games at short, and 15 at second base, so he does have versatility at middle infield. He had a .971 fielding percentage, with 257 put-outs and 349 assists at short. He had a perfect 1.000 fielding percentage at second. At the plate, Suarez hit a very respectable .288, with 34 doubles, had 64 RBI’s, and stole 21 bases. Keep in mind, these are all in 2012 at the Single-A level. He’ll still need a few more seasons to develop, but the Tigers I’m sure are very happy with the way he’s progressing, and I’m confident he’ll be scooping ’em up at Comerica in no time. Just not this year. 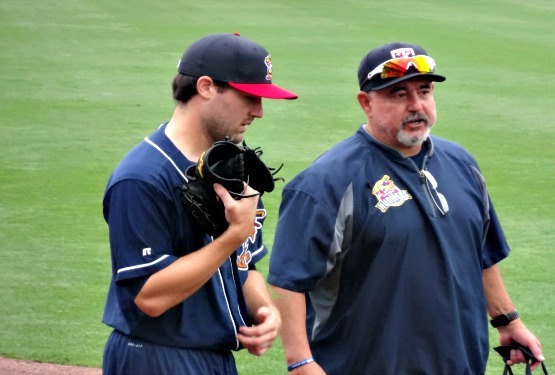 The Detroit Tigers top prospect Nick Castellanos went 2-5 in last nights Arizona Fall League Rising Stars Game. He batted fourth, and was the DH for the West team. His first hit was a shot to right-center off Twins’ prospect Kyle Gibson, and his second was a rip though the left side of the infield off Mariner prospect left-hander James Paxton. Playing for the Mesa Solar Sox, he’s hitting .239 with one home run and three RBI’s. In Lakeland this season, he hit .405 with three home runs, while in Erie he had an average of .264 and pounded seven homers. He played for the West Michigan Whitecaps in 2011, there he hit .312 with 76 RBI’s. He is joined on the Mesa team by some fellow Tiger prospects and Whitecaps alumni. 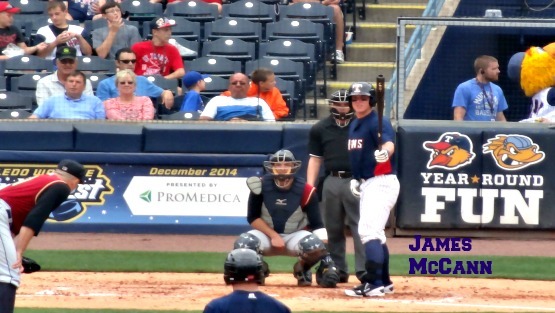 Catching prospect James McCann is hitting 7 for 26 in ten AFL games. First baseman Aaron Westlake played for the Whitecaps this season, where he hit .249. For Mesa, he’s .220 with three home runs. 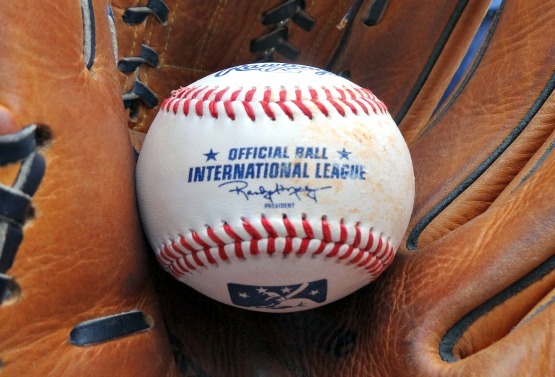 Pitching prospect Luke Putkonen is 0-1 with a 3.86 ERA, while striking out six batters. 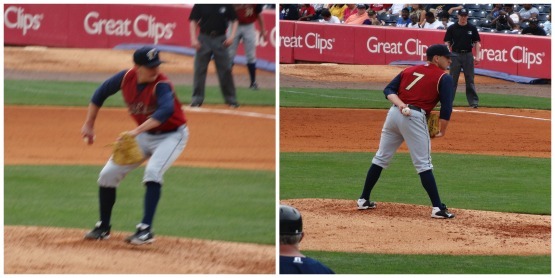 Relief pitcher Mike Morrison has appeared in eight games, only allowing three runs. Pitcher Matt Hoffman and Tyler Clark also play for Mesa.